We have added even more rich flavor to our ramen by incorporating Salt & Pepper Hempeh from our @eathempeh friends. Slice onion, carrots, and mushrooms into thick slices. In a medium sized pot, combine onion and mushroom slices with 1 tbsp olive oil. Sauté for 10 minutes on medium heat, or until onions are translucent and somewhat soft. Add vegetable broth, carrot slices, and herbs. Increase heat until broth begins to boil, then reduce to a simmer. Slice hempeh into long, thick slices. Brown each side of the slice in a cast iron pan on medium heat. Remove slices from heat and chop into chunks. 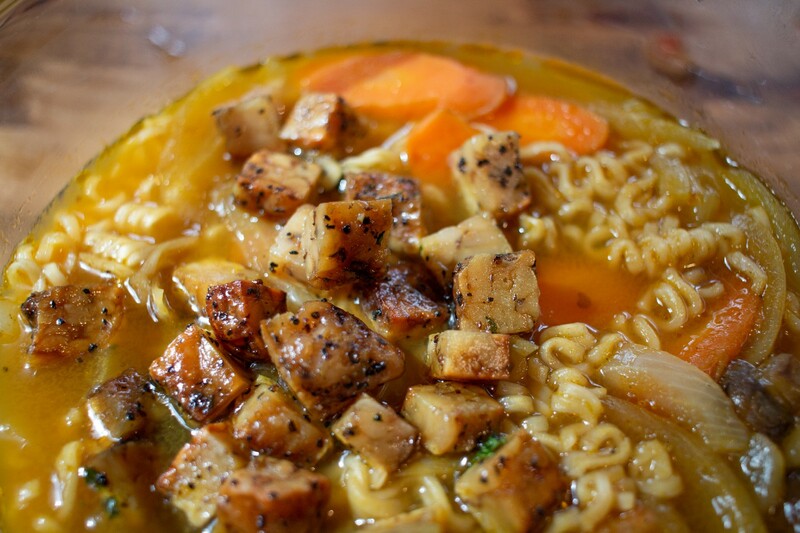 When carrots have become soft, add hempeh to the ramen and let simmer for 1 minute. Add noodles until they are fully cooked, then serve immediately.